This past Christmas, I knit 14 hats using yarn held double. I knit them in a hurry. And because I thought I was too busy to bother winding the yarn into balls and putting them into some yarn-tangling-avoidance device, I lost a ton of time untwisting and de-knotting things, not to mention chasing short runs of leftover yarn - the stuff I did wind - across the room in the days before I discovered Stock Pot as a Knitting Aid. This past weekend, I worked out a design for another hat using yarn held double and decided to be older and wiser about it; I wound both skeins into balls and slipped each one into a separate Ziploc bag with a corner snipped out of the bottom. 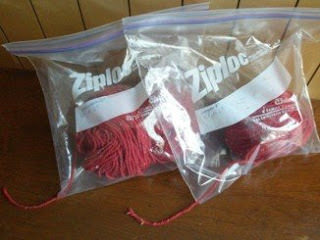 My yarn stayed clean and untangled and I was able to track the yardage much more easily. But you know what? Ew! I spent the whole project listening to the rustle and scrape of plastic, and every time I glanced down to gauge whether or not I was going to have enough yarn to finish I had to look at all those little fibers pressed against the walls of the bag like puppies in a pet shop window begging to be free. Isn't there a better way? I've looked at yarn bells on Etsy - they're lovely and obviously an excellent solution for people who don't have to worry about leaving something breakable on the floor or finding a safe place for it every few minutes when the phone rings or the timer goes for whatever is in the oven*, but sadly I am not among their number. Tupperware has a FridgeSmart line of vented containers with lids, not to mention their vented microwaveable stuff, and I have some of that... but if you need to store a head of cauliflower** in the middle of a project it would be a pain to get the yarn out. And piercing a hole through a different sort of Tupperware lid would be something I'm pretty sure I'd regret later. Maybe I'd regret it less with some cheaper plastic lidded container. H'mmm. Anybody else got a solution or even an idea for one? *I'm joking - I'm knitting too much to be putting anything into the oven. **again, joking! I haven't had to deal with a head of cauliflower in months. A round oatmeal box? I currently have several that I can't bring myself to throw away. But the easier solution is to wind center-pull balls. You can do that by hand, if you don't have a ball winder. But if you don't have a ball winder (and a swift), hie thee to a yarn shop and get one immediately. You'll never regret it.